Sometimes it's hard to explain why a potentially decent set up yields so little, and yet occasional marginal ones can deliver. I think the issue last night was moisture - the LLJ arriving to generate increased shear also pushed some dryer air in at around 800mb effectively pinching the updrafts. Just a theory. Also it was interesting to see how the WF started to retreat N in an 'unforecast' way. Moisture was NOT a problem with 70f dewpoints east of that lone dryline storm near Elk, what did kill it off was a substantial Cap which got even stronger as the evening wore on. Also there was a massive clue about 45 minutes before the first tornadoes hit in SW Kansas, an MD Was issued stating the Warm Front was moving north faster than was expected and the Tornado watch was pushed North by 3 counties in Southern and SW Kansas, also a look at the Surface obs from 00z and 01z showed very clearly the 60f dewpoints marching northwards, as soon as that storm became discrete it hugged that warm front and turned east, the end was as expected but loads got suckered onto the dryline storm which shrivelled! Yes, there seemed to be a few factors going against yesterdays supercells realising their full potential, not least, as Paul said, the strong CINH in place, not helped also by the main forcing being too far west, hence why storms formed further north and west than expected into central KS. Also the surface was a bit too 'diffuse' to get storms really going, particularly the boundaries of the warm front and drylines. Crapvection earlier in the day and high cloud didn't help either by limiting surface heating despite favourable moisture. Still there was some brief rope and elephant trunk nadoes, but full potential of the set-up wasn't realised. Goes to show, despite the SPC's best efforts, their forecasts don't always go to plan, so its often down to the chaser to use or gain experience by now casting with current obs. Some really serious damage being reported from this. Based on last night's report, we have a possible count of 8 T's. 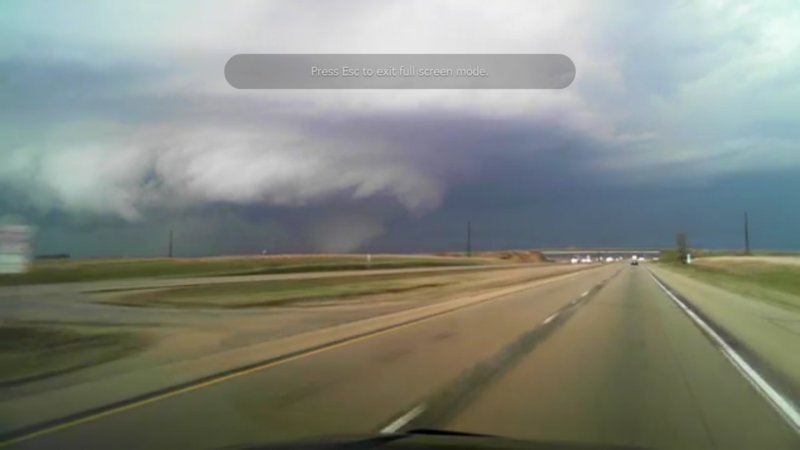 A very close encounter with the 'Rochelle' Illinois tornado. The driver of the truck remains extremely composed considering a violent wedge tornado is about to wreck everything in its path. Apparently had a kid in the car too. Unbelievable stupidity. Sorry for the rant but this is classic bad reputation generation stuff. 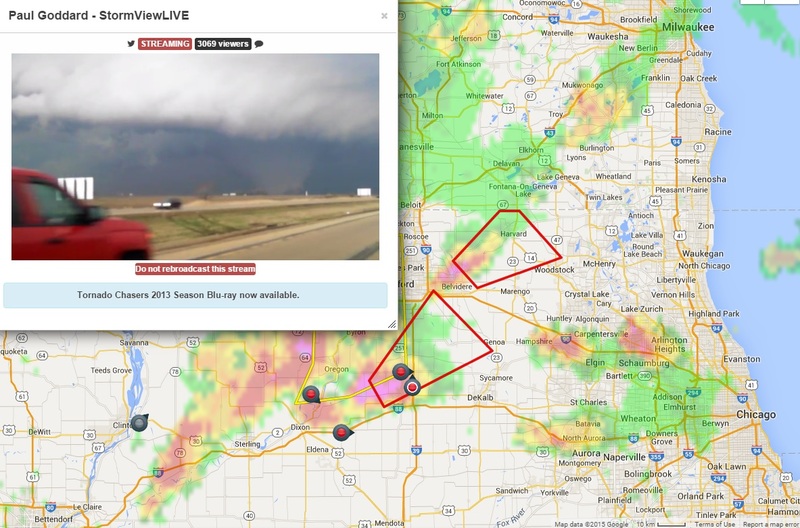 Although I agree its a dumb move as I'm sure he would have seen the tornado way before he was that close but this guy is not a chaser he was on his way to Indianapolis on a business meeting and has never experienced weather like this. 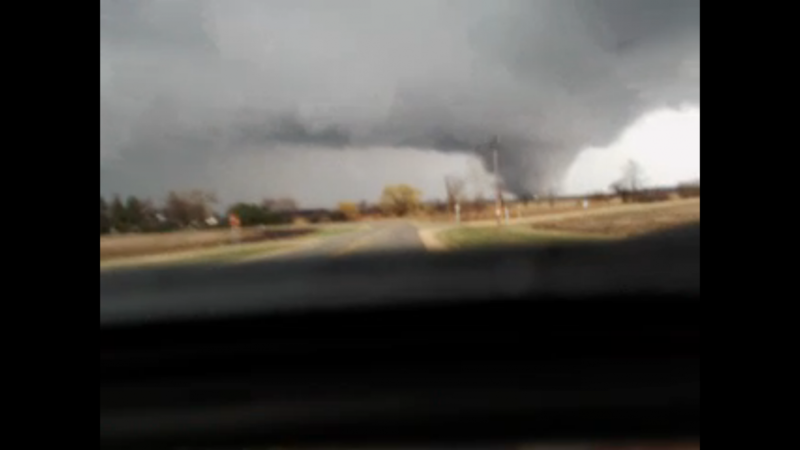 Prelim reports say it was an EF4...lasting 28 or so miles. Impressive for a 'modest'-ish setup. Even so, I'm pretty sure most people would have realised that just sitting there under a bridge wasn't a smart move. Would have been a Darwin award candidate for sure. Tornado warning north of Amarillo,VortexWx is in a sweet spot with some rotation. 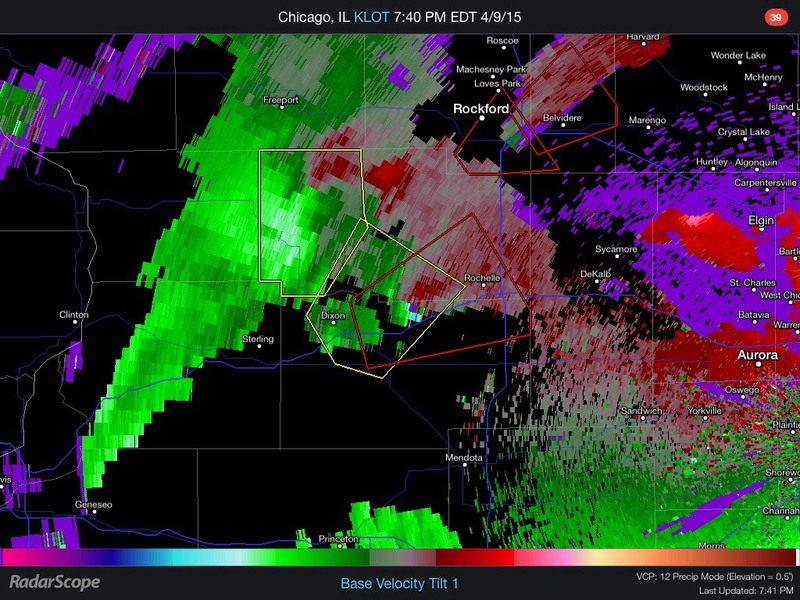 strong rotation on that cell now. VortexWx having to go south into Amarillo to go north as there is no east road to take,must be frustrating that,will they take the 136 or 60,personally i would take the 60 to Panhandle,more options there. the Leeper brothers are heading south down the 207 so they may encounter something perhaps. check out those hailstones on Kevin Saunders cam. Steve worthington on a tornado warning cell SE of Lamar. Yesterday provided just a single T report in KS. Some signals for a discrete supercell or two in the notch below the trailing front across C Texas this evening. Sufficient pockets of instability in 21C dps could do the trick and directional shear in abundance. 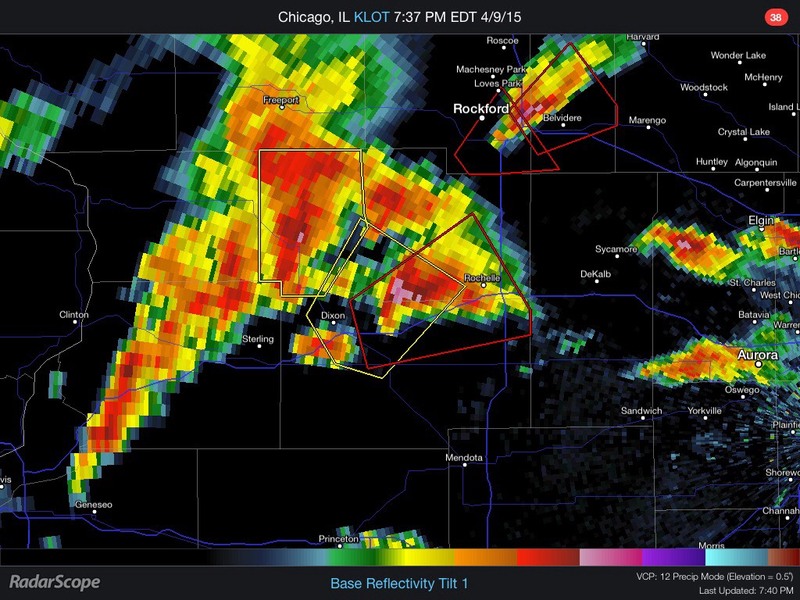 I'm doing some preliminary prep for a potential chase mid-May if an active set-up develops. Excited isn't the word! Good for us, because if you end up going Mid May it means it will be active, so lets hope for some decent May Chasing!